I hope you have the time of your life today! Happy birthday, sweetie! You are a lovely child and I’m sure you’ll also become a great adult one day. Dear child, may you have the greatest of times and enjoy every second of your birthday. Laugh and play surrounded by all of your loved ones, and make a lot of wishes, as I’m wishing for all of them to come true. You deserve to always be happy, and be loved at all times. You are special and I’m sure that whatever’s waiting for you in life will be great. Happy birthday to a great childhood friend, and an even better adult friend! 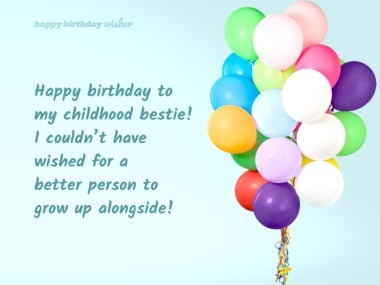 To one of my longest-standing friends, I wish you the very best birthday today! We’ve been pals for as long as I can remember, and I’m so glad we’ve never lost touch over the years. You’re a great friend that I know I can always rely on, even if sometimes we’re busy and haven’t checked in with each other for a few weeks or even a couple of months. We certainly do compensate for it over a good catch up, though! Thank you for always being there, and for making my childhood the most fantastic, memorable years of my life. I only have happy memories of us playing together all the time as kids. Cheers, to the most wonderful companion anyone could ask for in life! I feel so lucky to have you as my friend and to have known you since we were kids. 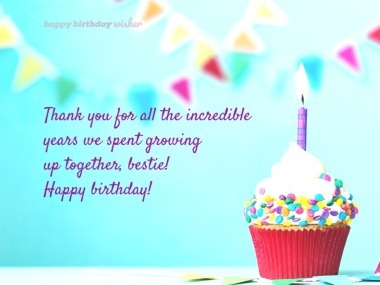 I am looking forward to sharing many more years of friendship and spending many more birthdays with you. I want you to have an amazing birthday which you deserve! Happy birthday to the one who knows me best and still chooses to stick around, my best friend in the whole world: you! We’ve known each other since we were kids and we can count on each other for the rest of our lives. Thank you for always being there for me. Have a great birthday and many more happy years to come! Sending the very best birthday wishes to my lifelong buddy! I am very lucky to have had such an extraordinary friend from childhood to adulthood, and hopefully long into old age! I am so grateful to have known you virtually my whole life! Enjoy your special day and I wish you all the very best for the year ahead! Cheers! and I think you’re amazing! and the best birthday bash! Happy birthday to my dear cousin! to me than a cousin. in the world on your special day! A friendship like ours is hard to find and hard to keep, but we have done a great job so far. Happy birthday, my friend! Wishing the happiest of birthdays to the person I have known for longer than I can remember! Have a fantastic day, my friend!